↑ "Central Intelligence Agency". Cia.gov. https://www.cia.gov/library/publications/the-world-factbook/fields/2098.html। আহৰণ কৰা হৈছে: 2012-05-06. ↑ "Ahmad Shah and the Durrani Empire". Library of Congress Country Studies on Afghanistan. 1997. Archived from the original on 22 July 2012. https://archive.is/9Fej। আহৰণ কৰা হৈছে: 25 August 2010. ↑ "Ahmad Shah Durrani". Encyclopædia Britannica Online. http://www.britannica.com/EBchecked/topic/10162/Ahmad-Shah-Durrani। আহৰণ কৰা হৈছে: 9 September 2010. ↑ "Population of Afghanistan". The World Factbook. CIA. 2010. https://www.cia.gov/library/publications/the-world-factbook/fields/2119.html?countryName=Afghanistan&countryCode=af&regionCode=sas&#af। আহৰণ কৰা হৈছে: 6 November 2011. ↑ "Chapter 2. The Society and Its Environment" (PDF). Afghanistan Country Study. Illinois Institute of Technology. pp. 105–06. http://www.gl.iit.edu/govdocs/afghanistan/Afghanistan-Chapter2.pdf। আহৰণ কৰা হৈছে: 12 October 2010. ↑ 7.0 7.1 7.2 7.3 "Afghanistan". International Monetary Fund. http://www.imf.org/external/pubs/ft/weo/2012/01/weodata/weorept.aspx?sy=2009&ey=2012&scsm=1&ssd=1&sort=country&ds=.&br=1&c=512&s=NGDPD%2CNGDPDPC%2CPPPGDP%2CPPPPC%2CLP&grp=0&a=&pr.x=80&pr.y=10। আহৰণ কৰা হৈছে: 17 April 2012. ↑ "Human Development Index and its components" (PDF). http://hdr.undp.org/en/media/HDR_2011_EN_Table1.pdf। আহৰণ কৰা হৈছে: 2012-05-19. ↑ "Afghanistan – John Ford Shroder, University of Nebraska". Webcitation.org. http://www.webcitation.org/5kwDUj6WJ। আহৰণ কৰা হৈছে: 2012-05-19. ↑ Afghanistan: ancient Ariana (1950), Information Bureau, London, p3. ↑ "Ariana". Flyariana.com. Archived from the original on 23 January 2010. http://flyariana.com/schedules.php#। আহৰণ কৰা হৈছে: 29 December 2009. ↑ Haber, M; Platt DE, Ashrafian Bonab M, Youhanna SC, Soria-Hernanz DF (2012). "Afghanistan's Ethnic Groups Share a Y-Chromosomal Heritage Structured by Historical Events". PLoS ONE (3). doi:10.1371/journal.pone.0034288. http://www.plosone.org/article/info:doi/10.1371/journal.pone.0034288. 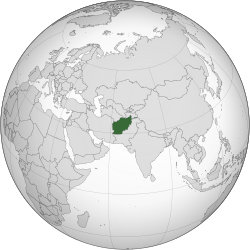 ↑ 21.0 21.1 21.2 "Country Profile: Afghanistan". Library of Congress Country Studies on Afghanistan. August 2008. Archived from the original on 26 February 2005. http://web.archive.org/web/20050226190601/http://lcweb2.loc.gov/frd/cs/profiles/Afghanistan.pdf। আহৰণ কৰা হৈছে: 10 October 2010. ↑ "Ethnic groups: Pashtun 42%, Tajik 27%, Hazara 9%, Uzbek 9%, Aimak 4%, Turkmen 3%, Baloch 2%, other 4%". The World Factbook. CIA. https://www.cia.gov/library/publications/the-world-factbook/fields/2075.html?countryName=Afghanistan&countryCode=af&regionCode=sas&#af। আহৰণ কৰা হৈছে: 18 September 2010. ↑ "The World Factbok – Afghanistan". The World Factbook/Central Intelligence Agency. University of Missouri. 15 October 1991. Archived from the original on 27 April 2011. http://www.umsl.edu/services/govdocs/wofact90/world12.txt। আহৰণ কৰা হৈছে: 20 March 2011. "_#_Ethnic divisions: Pashtun 50%, Tajik 25%, Uzbek 9%, Hazara 12–15%; minor ethnic groups include Chahar Aimaks, Turkmen, Baloch, and other"
↑ "Ethnic divisions:". The World Factbook/CIA. University of Missouri. 22 January 1993. http://www.umsl.edu/services/govdocs/wofact92/wf930006.txt। আহৰণ কৰা হৈছে: 16 October 2010. "Pashtun 38%, Tajik 25%, Uzbek 6%, Hazara 19%; minor ethnic groups include Chahar Aimaks, Turkmen, Baloch, and others"
↑ "Ethnic Groups". Library of Congress Country Studies. 1997. Archived from the original on 14 July 2012. https://archive.is/bTfS। আহৰণ কৰা হৈছে: 8 October 2010. "In 1996, approximately 40% of Afghans were Pashtun, 11.4 of whom are of the Durrani tribal group and 13.8% of the Ghilzai group. Tajiks make up the second largest ethnic group with 25.3 % of the population, followed by Hazaras, 18 %; Uzbeks, 6.3 %; Turkmen, 2.5 %; Qizilbash, 1%; 6.9 % other." ↑ "Ethnic groups:". The World Factbook/CIA. University of Missouri. 2003. http://www.umsl.edu/services/govdocs/wofact2003/geos/af.html। আহৰণ কৰা হৈছে: 18 September 2010. "Pashtun 44%, Tajik 25%, Hazara 10%, minor ethnic groups (Aimaks, Turkmen, Baloch, and others) 13%, Uzbek 8%"
↑ "The Afghans – Language and Literacy". Barbara Robson and Juliene Lipson, with assistance from Farid Younos and Mariam Mehdi. প্ৰকাশক United States: Center for Applied Linguistics. 30 June 2002. http://www.cal.org/co/afghan/alang.html। আহৰণ কৰা হৈছে: 16 September 2010. ↑ "Population". The World Factbook. CIA. https://www.cia.gov/library/publications/the-world-factbook/fields/2098.html। আহৰণ কৰা হৈছে: 24 September 2011. "Languages: Afghan Persian or Dari (official) 50%, Pashto (official) 35%, Turkic languages (primarily Uzbek and Turkmen) 11%, 30 minor languages (primarily Balochi and Pashai) 4%, much bilingualism"
↑ "Mapping the Global Muslim Population: A Report on the Size and Distribution of the World's Muslim Population". Pew Research Center. 7 October 2009. Archived from the original on 30 August 2010. http://pewforum.org/Muslim/Mapping-the-Global-Muslim-Population%286%29.aspx। আহৰণ কৰা হৈছে: 3 September 2010. ↑ Miller, Tracy, ed (October 2009) (PDF). Mapping the Global Muslim Population: A Report on the Size and Distribution of the World's Muslim Population. Pew Research Center. Archived from the original on 5 August 2010. http://web.archive.org/web/20100805091041/http://pewforum.org/newassets/images/reports/Muslimpopulation/Muslimpopulation.pdf। আহৰণ কৰা হৈছে: 3 September 2010. ↑ "Afghanistan". The World Factbook. The World Factbook. https://www.cia.gov/library/publications/the-world-factbook/docs/notesanddefs.html?countryName=Afghanistan&countryCode=af&regionCode=sas#2122। আহৰণ কৰা হৈছে: 3 September 2010. "Religions: Sunni Muslim 80%, Shia Muslim 19%, other 1%"
↑ Lavina Melwani, New York. "Hindus Abandon Afghanistan". Hinduism Today. http://www.hinduismtoday.com/archives/1994/4/1994-4-02.shtml। আহৰণ কৰা হৈছে: 2012-05-19. ↑ Majumder, Sanjoy (2003-09-25). "Sikhs struggle in Afghanistan". BBC News. http://news.bbc.co.uk/1/hi/world/south_asia/3138282.stm। আহৰণ কৰা হৈছে: 2012-05-19. ↑ "Education". United States Agency for International Development (USAID). http://afghanistan.usaid.gov/en/programs/education#Tab=Description। আহৰণ কৰা হৈছে: 11 August 2011. ↑ "Rising literacy in Afghanistan ensures transition | Article | The United States Army". Army.mil. http://www.army.mil/article/59541/Rising_literacy_in_Afghanistan_ensures_transition/। আহৰণ কৰা হৈছে: 4 February 2012.